New evidence, lessons learned, and insights from two external evaluations. A time to reflect and also to look forward to expanded research, new collaboration, and global alignment toward mutual nutrition and health goals. With four successful years completed in 2015, the CGIAR Research Program on Agriculture for Nutrition and Health (A4NH) is excited to draw on important lessons from past years, continue building a strong evidence base, and also plan for new projects, expanded research areas, and opportunities to scale. The 2015 A4NH Annual Report, detailed our latest progress and plans, is now available. A4NH’s commitment to its goals is stronger than ever, with similar enthusiasm from the development community for making agriculture and other sectors more nutrition and health-sensitive. Globally, the Sustainable Development Goals, adopted in 2015, placed strong emphasis on the importance of food and nutrition security, health, equity and empowerment, and country ownership and leadership, while CGIAR’s new Strategy and Results Framework (SRF), also released in 2015, gives similar weight to improved nutrition security and health as a critical outcome for development. In A4NH’s 2015 Annual Report, the program’s accomplishments span four research flagships: Value Chains for Enhanced Nutrition, Biofortification, Agriculture-Associated Diseases, and Integrated Programs and Policies. By the end of 2015, biofortified crops had reached approximately 15 million people. New evidence from Burkina Faso showed that an integrated agriculture program can improve maternal and child health and nutrition outcomes, and also empower women. A disease control framework was put to good use in Kenya, stemming the spread of Rift Valley fever outbreaks. There is much to look forward to as well. The report’s feature on enabling environments for better nutrition showcases efforts to design and implement nutrition-sensitive policies around the world, including South Asia and east Africa. The feature on building knowledge and evidence highlights a new portfolio of rigorous, gender-sensitive studies in South Asia that will explore various modalities to achieve maternal and child nutrition targets by leveraging agriculture and empowering women. In addition, A4NH has begun planning for a second phase of the program, in addition to an expanded portfolio that includes food systems research and collaborations with public health partners. In 2015, A4NH celebrates new evidence, strong partnerships, and a renewed commitment to making agriculture and other sectors more nutrition and health-sensitive. 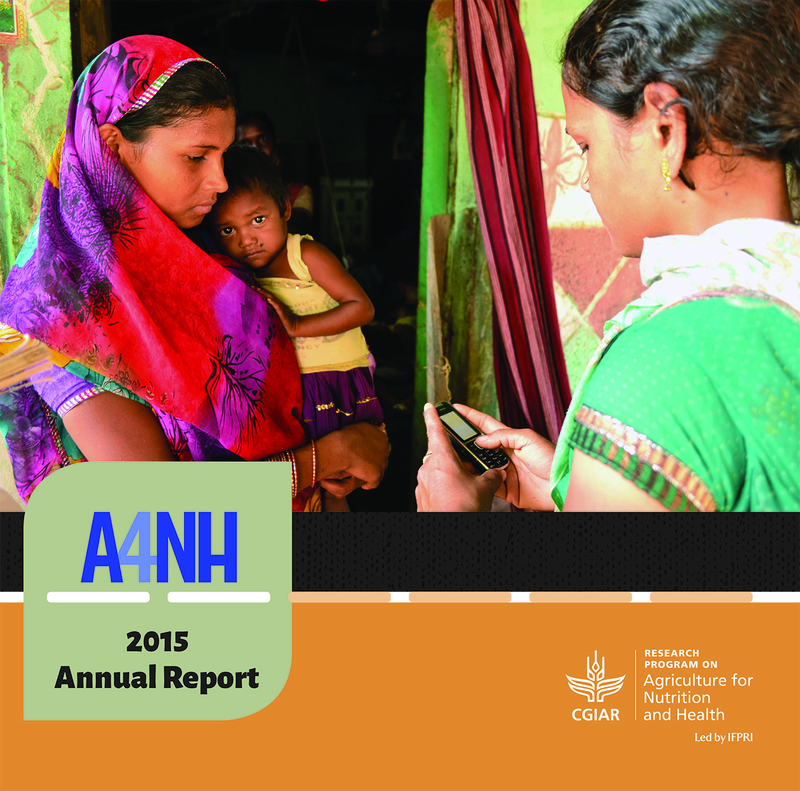 Download the full 2015 A4NH Annual Report here. Please enjoy learning about our recent progress, results, and collaboration by downloading the full 2015 Annual Report, or visit the program website to learn more about our ongoing research. To request a hard copy of the 2015 report, please contact Kimberly Keeton, A4NH communication specialist.